On September 20, 2007, Miles Nolte posted the final installment of his summer job memoir on The Drake magazine’s Internet message board. 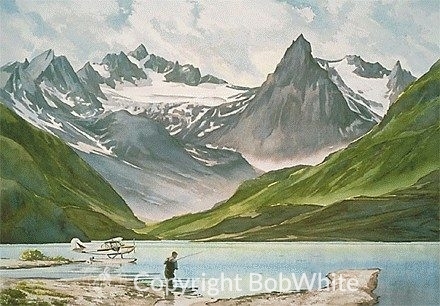 For seventeen weeks, Nolte had used his laptop and a satellite Internet connection to transmit his semi-daily account of what it’s really like to be a fly fishing guide on a remote Alaskan river. Sitting in his tent above a river packed with migrating salmon and gluttonous trout, he wrote about anglers that he enjoyed guiding and others that he couldn’t wait to get rid of. He described epic fishing days and days of bitter disappointment. He typed about wolves and eagles and beavers and bears. Lots of bears. There were periods of sunny weather and dry flies, followed by stretches of relentless rain, wind, and cold. And beyond the trials that nature doled out, Miles also described how overworked outboards don’t always start, tents sometimes catch fire, and dysfunction often runs rampant among divergent guide and client personalities that are thrust together in a desolate and trying environment. By the time Miles returned from Alaska, his online musings had attracted a loyal and vicarious following of anglers and guides from around the world. They praised him for his articulate candor, and they thanked him profusely for transporting them with each new post to a place they may have otherwise never reached. 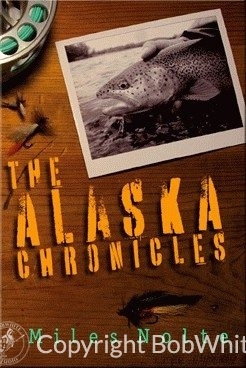 Departure Publishing is proud to present The Alaska Chronicles, a fishing guide’s memoir that originated and evolved in a most unusual manner. If you’ve ever fished Alaska, or if you hope to someday, this book will leave you with an insightful view of the outfitting business and a newfound appreciation for North America’s most pristine and prolific coldwater fishery. Miles Nolte was born in Honolulu, Hawaii, and raised in Kailua. After high school he attended Pitzer College in Claremont, California where he earned a Batchelor’s Degree in English and World Literature. After college Miles moved to Botswana where he spent two years teaching writing and occasionally casting streamers at tigerfish. In 2002, Miles returned to Hawaii where he lived with his parents, surfed, and worked days as a carpenter’s apprentice, and nights as a cocktail server at the local country club. In 2003, he used his savings to buy a plane ticket to Bozeman, Montana. For the next three years Miles fished 150 days a year, taught snowboarding, waited tables, and worked as an advisor and teacher’s assistant in the English department at Montana State University. It was during this time that he cultivated a long-distance fascination with Alaska’s famed Bristol Bay watershed. In 2006, Miles realized that the only way he’d ever get to fish Alaska was to work there. At that point he applied for the guiding job that eventually spanned two and a half summers and led to the writing of this book. Currently, Miles is back in Bozeman fulltime with plans to eventually attend graduate school. Until then, he’ll continue to teach snowboarding, work in the same restaurant that keeps him employed between seasons, and guide fly fishermen everywhere he can.